We are pleased to announce a discounted parking opportunity exclusively for Detroit Connector customers. 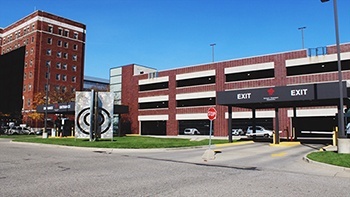 The card is for covered parking at the following location near the Detroit Connector stop. The first day you park, you will take a ticket when you enter the parking facility. Upon exiting, hand your ticket and ID to the parking attendant, and you will receive your access card. Request a card in advance by filling out and submitting this form. Request a card by phone either in advance or on the first day you park by calling 855.487.6727, and press 1. To order additional cards, or If you prefer to order directly by phone, call 855.847.6727 and press 1. You can order your card in advance of your first use, OR even the same day after you have parked in the ramp. Phone hours are Monday – Friday, 7 am – 7 pm. Parking services are managed by Ultimate Parking Management, 1001 Woodward Avenue, Detroit, MI 48226.